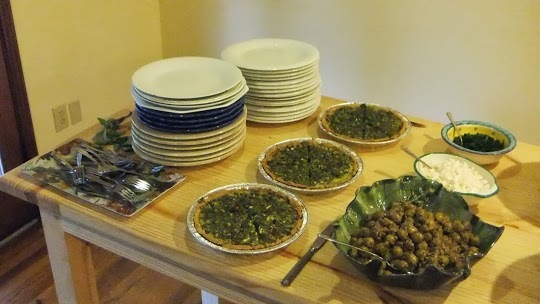 At a recent Seasonal Soiree gathering, I served a delicious spanakopita dish. Another local woman and I collaborate on this monthly event at the MS Modern Homestead Center. I really enjoy the Seasonal Soirees as they provide me and my culinary collaborator endless avenues for creative expression through taste. Further, we get to support local farmers and educate people on the importance of local food, both nutritionally and economically. Our last Seasonal Soiree focused on the beauty of the honey bee, as well as its recent challenges with Bee Colony Collapse Disorder (largely due to pesticide use, especially harsh pesticides). Because we wished to focus on honey and honey bees, we looked to the Mediterranean and the Middle East for culinary inspiration. And, it was this menu that gave birth to this recipe ~ enjoy! I know some people have been waiting for me to write this blog, so here you go! Chop all of these ingredients or use a food processor. Mix well. Scoop into pie crust and form the top with a spatula, pressing firmly. Sprinkle the top lightly with cinnamon. Bake for 45 minutes. Cover if edges begin to brown too quickly. we had ever tasted. Now I’m wondering if it wasn’t also because of your “Superfood Sprinkles” Gotta get me some of that!